tai chi stars are born! Despite the continued atrocious weather across the South West of England, I spent a lovely afternoon with my Exminster tai-chiers, together with a film crew from the British Heart Foundation (BHF). 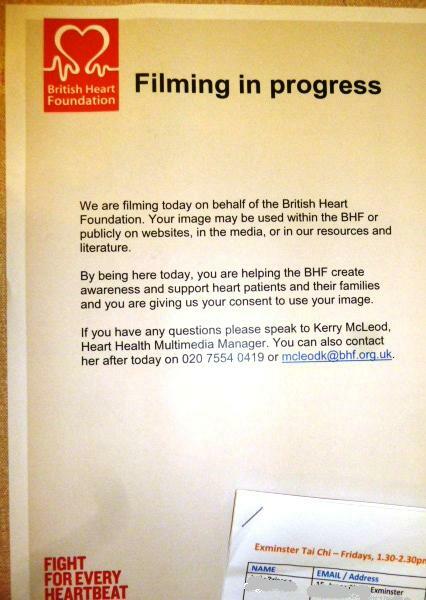 BHF are compiling 6 case studies of people who’ve have some form of cardiac disease or cope with some disability and demonstrating how they manage/improve/retain their health through various activities. For two of the case studies that includes tai chi, with me! Let’s call these two lovely people Freda and Fred. They’re different ages (88 yrs and mid 60’s), have lived very different lives, are managing very different conditions. Both have found something very positive in tai chi for improving their general health and wellbeing – be it around feeling more relaxed and calmer, having improved balance, increased energy levels, better mobility and stability, increased strength and not forgetting the social element – we’re focussed in class but don’t take ourselves too seriously. Freda is getting a taste for stardom. A long time fan of “Pretty Woman”, she “negotiated” with the BHF that they could only film her if they ensured Richard Gere came to town too! I’ve been pondering on what Freda and Fred have in common. The thing that springs to mind, loud and clear, is a positive “can-do” mindset, despite pain and disability and recovering from illness. A salient reminder in itself of the importance of engaging the body AND mind in every aspect of our tai chi practise, and that bringing together of mind and body is one of tai chi’s great strengths.